One of the most devastating and least understood impacts of a serious car accident can be a victim who has suffered with a traumatic brain injury (TBI). But what exactly is considered a TBI? And how does this relate to a personal injury claim? Read here to learn more about accidents and brain injuries with a brain injury attorney Boca Raton. A victim’s life may be significantly after an accident that caused a concussion or other severe head injury. While some individuals who suffer from a TBI only experience discomfort, pain, and therapy for a short period of time before they resume life as normal, others will have experience problems with cognitive issues such as concentration, memory, motor skills, and may even require long-term rehabilitation and therapy. Symptoms of a brain injury can be difficult to determine. In fact, an individual might be experiencing symptoms of a brain injury, and you may not even realize. One of the most important things you can do after you sustain car accident injuries in the state of Florida is to consult with a medical professional or even seek emergency care. Read more about symptoms of a TBI here. Traumatic brain injuries are constantly being researched and explored by medical professionals and scientists all over the world. In recent years, research studies have looked at the long term impacts of traumatic brain injuries such as neurological disorders and high risk of dementia. 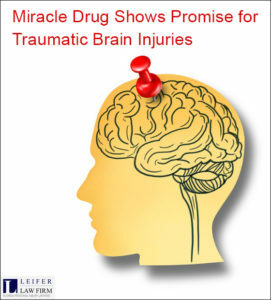 A new study has indicated that a drug may hold promise for minimizing the damage to the brain caused by such an injury. In fact, a recent study reported in medical news today discovered that brain plaques were common in people who suffered TBI from as long ago as 17 years before their Alzheimer’s became apparent. A new experimental drug known as MW151 could help to minimize the long-term impacts of brain damage caused by traumatic brain injury. After a serious head injury your body tells the immune cells to respond to the site of the trauma and initiate the healing process. Although these cells can help you recover from the injury, they might also lead to inflammation that can damage your brain tissue. Researchers have identified that so far MW151 is able to minimize cognitive impairment caused by closed head injuries. Learn more about the MW151 drug here. The new study will be looking at more severe forms of traumatic brain injury such as diffused axonal injuries. In this type of injury the damage can be more widespread as a result of the brain being jostled around in the skull during an incident such as a car accident. If you have been injured in a car accident and suspect that you have a traumatic brain injury or other serious medical damage, it is strongly recommended that you consult with a brain injury attorney in Boca Raton as soon as possible. While an attorney isn’t a doctor, we can help you and your family with the legal repercussions and even give you legal advice if your TBI was a result from an accident. Visit here to get started with a brain injury attorney Boca Raton today.